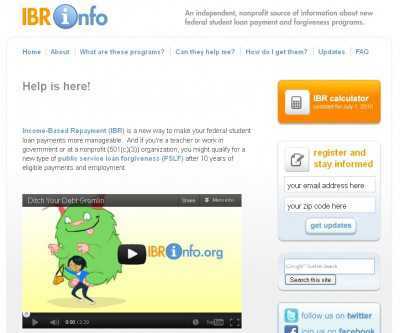 IBRinfo.org is a website that brings together information on federal student payment and forgiveness programs. The site’s named after the new Income- Based Repayment programs (IBR); these have been created to make it easier to handle federal student loan payments. And IBRinfo.org explains exactly what the eligibility requirements for one such program are, as well as all the different ways in which getting one would simplify the management of your existing debts. Just take a look at the sections named “What are these programs”, “How do I get them” and “Can they help me?” to find out as much. And in addition to letting you know everything about these federal student loan payment programs, IBRinfo.org includes information on the new public service loan forgiveness (PSLF) programs that have recently been announced. These are available to teachers and people who have worked either in the government, or in any non-profit (501(c)(3) organization for 10 years or more. And IBRinfo.org explains how to apply for one, and which kind of documents you must furnish to back your application. Most of that information is made available on videos like the one you can see below. 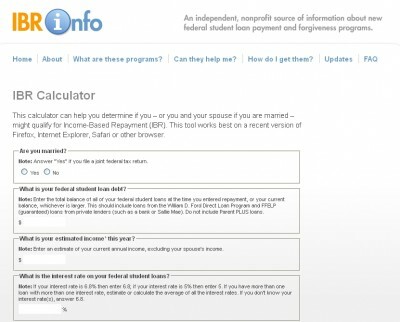 And the site’s rounded by an IBR calculator that will let you quickly realize if you qualify for Income-Based Repayment. And if you want, you can register for updates by submitting your email address and your ZIP code on the homepage.